Hostel 77 Bern i Bern, Schweiz: Bestill nå! These conditions are also valid for the reductions according to the group number or the length of stay. We request a payment in advance of one third of the total amount to guarantee the booking. Our independent hostel Hostel 77 Bern has been set up here, on the site of a former Hospital in Bern on the foot of the Gurten. How did we transform a modest, functional personnel house into a cosy, welcoming hostel? With heaps of dedication and enthusiasm! Come and have look for yourself! 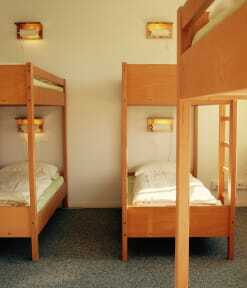 The hostel provides 116 beds. All prices include breakfast buffet, bed linen and duvet, free WiFi and a ticket for Bern’s local transport. Our hostel 77 offers far more than just a bed! - a nourishing breakfast with homemade, crunchy muesli, a wide variety of bread, local cheeses, coffee, fairtrade orange juice, etc. -reception and bistro lounge with refreshing drinks, delicious bernese coffee, local beer, etc. ...are passionate hosts and an experienced staff of world travellers. ...have worked together for many years as a well-integrated and coordinated team. ...look forward to greeting people from everywhere in the world. ...have a warm welcome for you at our Hostel 77! The Hostel 77 is situated at the foot of the Gurten (little mountain) and can be reached by bus from the main station in 7 minutes only. The journey from the station to the Hostel 77 and the use of local public transport in the city of Bern is free during your stay. There is a direct bus line from the Hostel to Gurten cable car and to the Aare River. Check in from 15:00 to 00:30 . Check out from 07:00 to 10:30 . If you arrive later than midnight, please let us know. We will inform you about the late-check-in procedure. Nice hostel. Friendly staff that helps you with everything.